Student loan debt is a $1.3 trillion problem in the United States, and it’s showing few signs of slowing down. On average, borrowers owe a staggering 70% more upon graduation than their predecessors just a decade ago. Student debt now has a higher rate of delinquency than any other type of household debt, and with interest rates poised to rise, default rates may accelerate. What then, is the true cost of higher education? 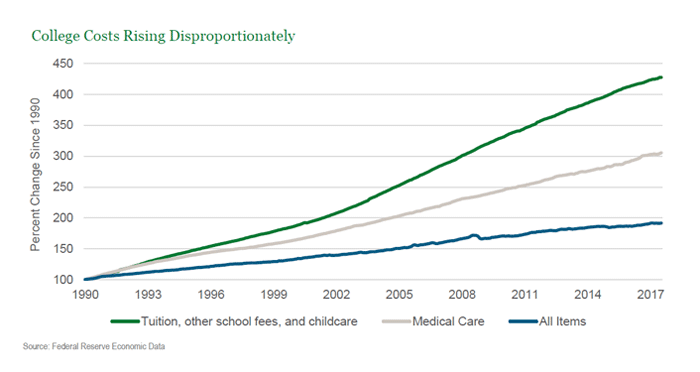 Since 1990, the cost of education has grown at over twice the rate of overall consumer prices and has far outpaced the often discussed rising medical care costs. While the factors driving this increase are unclear, the unrelenting cost increases are raising debt loads and weighing on the millennial generation, and in turn, the economy. At the same time, millennials are not seeing a corresponding increase in value for their college degrees, nor has holding a degree sheltered graduates from stagnant wages. According to the National Association of Colleges and Employers, starting salaries for new college graduates have risen by just 0.1% per year after adjusting for the effects of inflation. Yet, according to the New York Fed, these factors haven’t deterred young Americans from going to college. Instead, they simply borrow more. The charts are compelling, but how do the numbers translate to real life for college graduates? For the 70% of new college grads living with student debt, the average student loan balance is more than $37,000. This means an average monthly payment of $351. 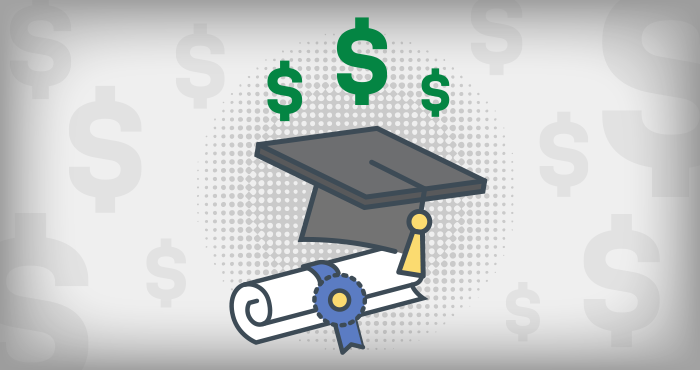 To put that in perspective, if a graduate invested that $351 each month, assuming a 5% rate of return, he or she could have more than $50,000 saved after ten years. For many in their twenties and thirties, $351 per month might mean living paycheck to paycheck, an apartment instead of a house, or avoiding these costs altogether by living with their parents. 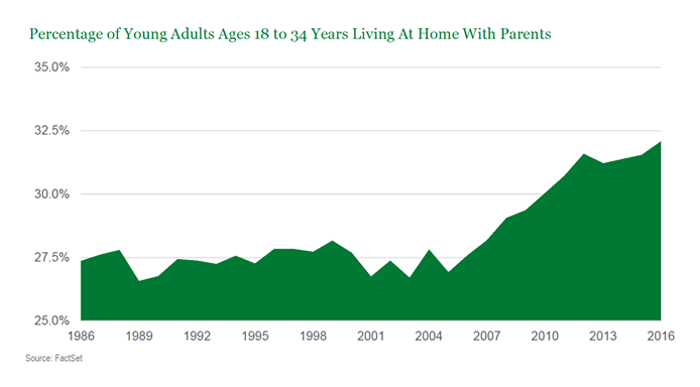 Indeed, mounting student loans force many millennials to live with Mom and Dad. This delays household creation and the economy-boosting benefits that come with it. In 2007, 32% of those in their twenties owned a home, compared with 21% in 2016. The National Association of Realtors reports that an astounding 71% of non-homeowners cite student loan debt as the factor delaying their home purchase. Falling homeownership has meant missed opportunity for the economy. A return to the historical average homeownership rate for those households headed by a person 25-34 years old would require more than the 1.5 million homes for sale today. This could lead to more houses being built, which is more impactful for the economy than existing home sales. Beyond housing, student debt tempers discretionary and business spending as well. Nearly half of student loan borrowers have put off buying a car because of debt, and a third of holiday shoppers say they limit their holiday gifting due to student debt. Student loans also hurt business creation, with fewer borrowers able to start businesses because of debt loads. As interest rates rise, we will be keeping an eye on default rates. Already, one in ten borrowers are at least 90 days behind in repaying their student debt, with 11.2% of aggregate student loan debt 90+ days delinquent or in default. More than half of the students who left college in 2009 have either defaulted, missed at least four months of required payments, or are facing higher loan balances than five years ago. What does all of this mean for investors? From an individual security perspective, we are finding opportunity in acquiring student loan asset-backed securities. Our exposure is to debt issued by private lenders. This is considered to be higher quality debt, since private lenders are more selective about who they lend to and often require a co-signer. From a macro perspective, however, rising student debt and its byproducts contribute to our long-term slow growth outlook. 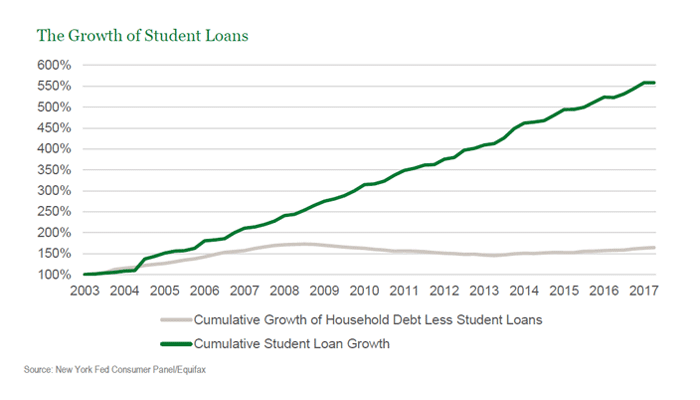 While we do not believe that current student debt dynamics pose an imminent risk, rising debt levels represent a headwind to economic growth. Without meaningful change by way of policy or better consumer education, the student debt problem may continue to grow. Learn more about consumer debt and its implications for the U.S. economy in our new infographic, The Consumer Debt Burden.